At Wimpy’s in Durham, napkins are futile and condiment stains are a sure sign of battle. Here, the brave take on burgers, and everyone wins. The Garbage Burger attacks your mouth like a ground-beef boulder shot from a cannon, packing two quarter-pound patties, chili, bacon, slaw, pickles, onions, cheese, and every condiment you can conceivably slather. That’s four servings of meat, in case you’re counting. The only way to subdue this beast of a hamburger is to grab it with two hands, squeeze it like a critter with its leg caught in a trap, and chomp without mercy until it surrenders. Forget napkins. You’ll need about 10 paper towels. And a bib. “That’s a two-fister right there,” says Brenda Mishoe, co-owner of Wimpy’s Grill in Durham, which sells 20 of these monsters every day. Maybe 40 on a Friday afternoon. But the beautiful thing about the Garbage Burger, and about all the greasy creations at Wimpy’s, is you never regret overindulging. Even after eating the biggest meal Wimpy’s makes — a sandwich so large and uncontrollable that a Duke University fraternity once dared a pledge to eat it with just one napkin — you don’t feel like you just ate a bowling ball. You don’t even need a nap. The difference at Wimpy’s is that Larry Mishoe, Brenda’s husband of 42 years, hand-grinds 40 pounds of beef every morning starting at 4 a.m. It’s 80/20 ground beef rather than ground chuck — not the leanest stuff around, but not the fattiest, either. The Garbage Burger isn’t exactly nutritious, but at least it’s fresh and fattening. “Got to have fat to give it flavor,” Larry explains. All the Texas sweet onions are hand-chopped. All the slaw is handmade. No matter how big your burger (and Wimpy’s offers a variety of smaller, non-garbage sandwiches), it doesn’t come out of a freezer or a can or a bag. Since 1987, the Mishoes have driven every weekday from Hillsborough to their little A-frame building on Hicks Street with the idea that their burgers will come out identical each time. If you ate it once and loved it, they figure, you’ll want it that way tomorrow, too. Their place is old-fashioned to the point that the food is cash-only, takeout-only. So little changes at Wimpy’s that the business cards hanging on the bulletin board have turned a coffee shade of brown, having been tacked there decades ago. In all likelihood, you’ll eat your burger in the front seat of your car, parked in the Wimpy’s lot. And when you’re finished, you’ll scoop the leavings off the wrapper with your fingers, licking them clean. In extreme-food circles, Adam Richman boasts an international following of devoted gluttons. For his Travel Channel reality show “Man V. Food,” Richman has tackled a six-pound steak in Texas, a 10-pound pizza in Connecticut, and, to the Mishoes’ delight, the Garbage Burger at Wimpy’s. “They wanted something outrageous,” Larry says. Over the course of a day’s filming, Wimpy’s fed Richman an estimated five Garbage Burgers, enough meat to stop up a municipal sewer system, let alone the average eater’s digestive plumbing. Richman tucked into Wimpy’s signature burger with gusto. Since that day, the Wimpy’s episode of “Man V. Food” has aired dozens of times, and the Mishoes have seen the hordes flood into their grill like members of a meat cult. “Man V. Food” viewers have been known to travel around the country, making stops anywhere Richman has contended with an oversize meal. Four patrons came from England, having seen the footage at home. Every state in the union has sent a delegate to Wimpy’s. 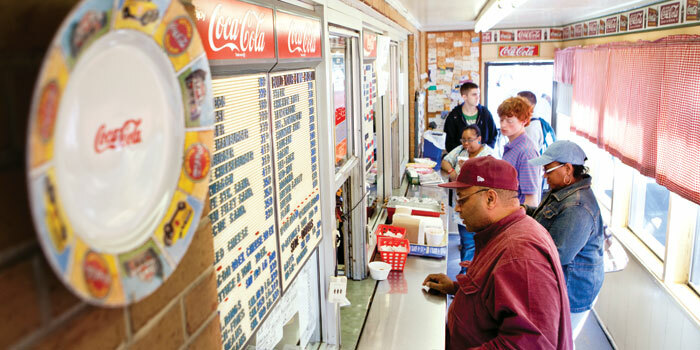 Regardless of its international following, Wimpy’s is all-Carolina, from the cherry cobbler to the banana pudding to the giant fatback biscuit — all of it homemade. Besides the Garbage Burger, a favorite is the Carolina style with chili, slaw, and mustard, practically standard ingredients in the Old North State. Larry Mishoe spent the better part of 25 years as a butcher, sometimes with Harris Teeter, sometimes with the old Durham A&P market nearby, which is now a Whole Foods. He gets his beef the way the grocery stores get theirs: in long tubes, ready for one last grind. Also a former Army cook, Mishoe liked the idea of running his own burger place, especially because he could knock off from work at 2 p.m. in time for his son’s Little League games. At 63, his back isn’t as strong as it used to be, but you’ll still find either him or Brenda at the cash register, scribbling orders on a pad. Wimpy’s draws Duke students, downtown bankers, and workers from the nearby plumbing supply house. Wait in line for a burger — and there’s always a line — and you’ll be entertained by chatter about how Duke’s basketball team can’t rely on three-pointers, or how the Tar Heels need a reliable outside shooter. In the parking lot, alongside the railroad tracks or under the Coca-Cola sign, you’ll see people sitting on the tailgates of their trucks, trying to keep the Garbage Burger from splattering on their slacks. But from 7 a.m. to 2 p.m., you’ll hear the sound of Larry Mishoe pushing fresh beef into a grinder and the sound of patties landing on the grill with a sizzle, preparing for combat against North Carolina’s most daring eaters. Hours: Monday-Friday, 7 a.m.-2 p.m.
Josh Shaffer is an award-winning writer with The News & Observer in Raleigh.